Olive + Boone's Erin Haskell wearing "Magnolia" from her Fall 2014 collection. Wearers of Erin Haskell's headwear are going to get noticed — there's no way around it. 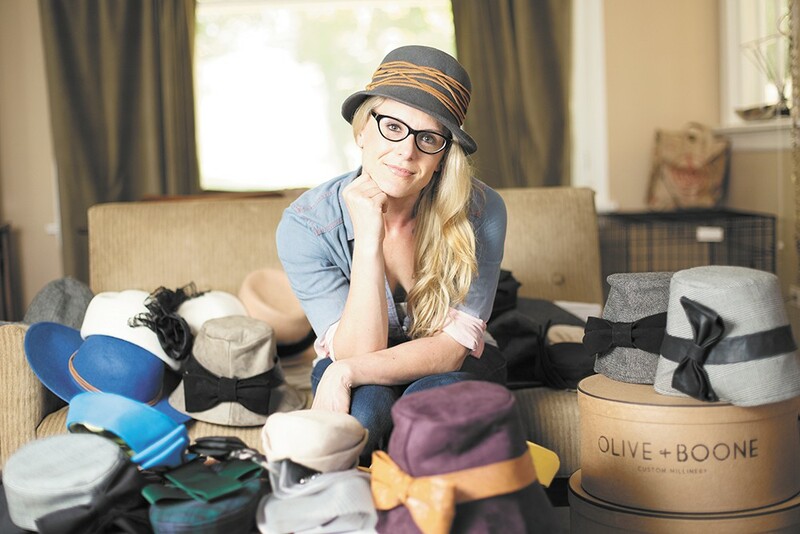 The young Spokane designer and creative force behind Olive + Boone Custom Millinery makes headwear that truly stands out, yet captures a timeless essence and a classic, retro appeal. An interior design master's graduate, former marketing rep and self-taught seamstress, Haskell began making her own hats after becoming frustrated with the mediocre quality and style of hats she found in stores. Paired with her passion for simple, elegant and functional design, she made her first headpiece more than two years ago. It's been quite the whirlwind since then. Olive + Boone's hats have since been shipped to customers all over the world — to London, Paris, L.A., New York and beyond. Made using the finest materials Haskell can find, from European crystals and fine fabrics to Spanish lace and repurposed fur from vintage coats, her pieces also have been featured in the pages of magazines and on popular fashion blogs. Even though many of her customers are located outside the area, Haskell is steadfast in her decision to keep the company based in Spokane. "I don't get discouraged when people say they love my stuff but would never wear one," Haskell says, reflecting on the mixed responses her hats have received in Spokane. Not all of her pieces are designed for formal occasions, but she still hopes to change people's minds about when and where they can and should wear hats. "It's not always about a big, fancy wedding or a polo event. I wear [my hats] to dinner all the time. I've always had the best nights wearing a hat." While early plans for a downtown showroom didn't pan out as planned, Haskell is still looking for an ideal storefront to showcase Olive + Boone's collections, and doesn't rule out having a showroom open in the near future. In the absence of that, Haskell has hosted several fashion and trunk shows in the area, with the annual Ronald McDonald House Charities' Cobra Polo Classic in September being one of the biggest local events. When she's not in Spokane designing and overseeing the business, Haskell travels to major cities for fashion markets to showcase her designs to boutiques and buyers. While much of the business focuses on custom orders, Olive + Boone offers numerous ready-to-wear collections of chic pillboxes, fascinators, bridal veils and vibrant, youthful crowns. New to Olive + Boone's inventory for fall 2014 is a highly anticipated menswear line Haskell has teamed up with former Gonzaga basketball star Zach Gourde to design. "So many men have approached me about making hats. I have a hunch the men's line will do better because guys aren't afraid to wear hats as an accessory."